Read the book. Seriously. 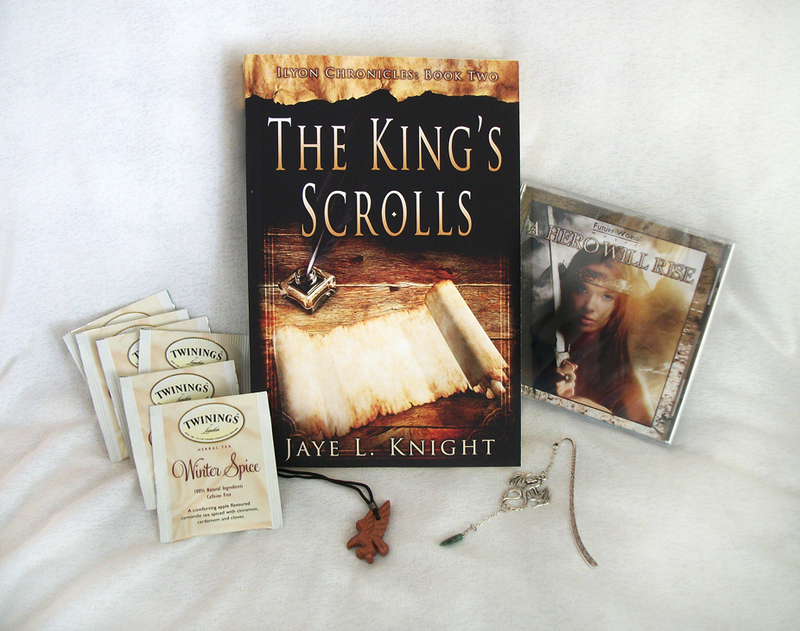 Though, if you’ve already read Resistance and The King’s Scrolls, then you were probably sitting on your porch waiting for UPS to deliver your copy long before this blog post was written (or you got really impatient and went straight to the kindle version!). If you haven’t read any of the Ilyon Chronicles yet, then go do it. Right now. I’ll wait until you get back. Half Blood has more violence and more intense scenes than Resistance and The King’s Scrolls, though even the tear-jerking scene in this book can’t compare with the heart-destroying scene in The King’s Scrolls. The violence is not gratuitous, and Jaye dwells more on its effects on Jace than on what is physically happening. While reading it, I sometimes got the sense that Jace didn’t want to dwell on or see what was happening or what he was doing, and thus the reader didn’t either. It was a technique that worked really well for showing how Jace clung to his humanity even when everyone else was doing their best to strip him of it. The hardest part in this book is when Jace fears they may succeed. 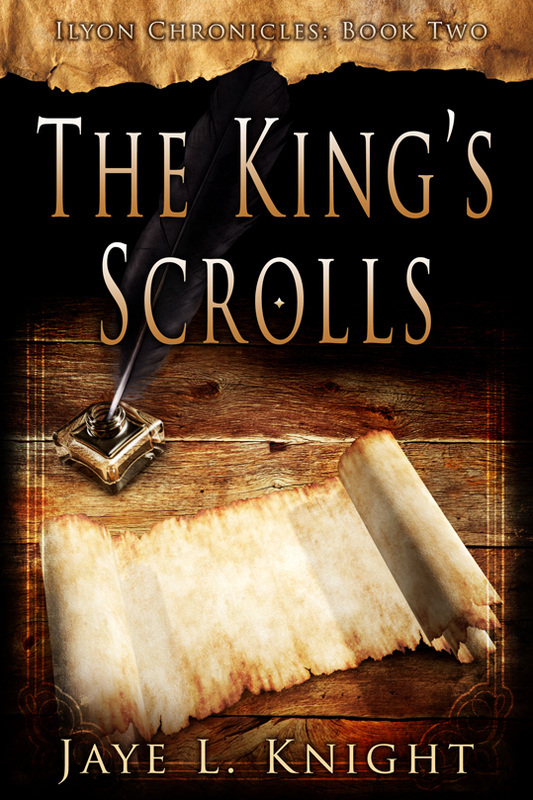 Since this is a novella, the book is much, much shorter than Resistance or The King’s Scrolls. While I probably would’ve kept reading had this novella been a tome, I think the shorter length worked for this book. Too much more details of the violence would’ve been overwhelming, and too much of the hope and happiness at the end would’ve dragged and taken away from the beginning of Resistance. I’d recommend reading this book after reading Resistance. Half Blood is a book written to satisfy the curiosity of fans and deepen their knowledge of one of the characters, and doesn’t serve as the sweeping introduction to the world of Ilyon the way that Resistance does. In reading through the blog tour so far, I’ve realized everyone asked you this question, but here it is again: Half Blood is a tough book to read (though I enjoyed it. I might have a strange fascination with reading about main characters suffering). Was it tough to write? What was the hardest part? I wouldn’t say it was overly tough to write. Perhaps that’s because I’ve known all along what kind life Jace lived, so it wasn’t new to me. The hardest part was probably making sure it all fit together and that the timeline of the story was accurate. I started this story at so many different points, and just kept going back further and further into Jace’s life, so in the end, I had to sort of connect the dots. I got a bit confusing at times, but I sorted it out. Suffering really shapes and defines characters, so while it’s a tough story, I’m glad to be able to share what shaped Jace to be who he is in the series. I can imagine how difficult it must have been to fit it in with all the pieces of Jace’s backstory you’d already mentioned, and the ones you have planned for Samara’s Peril. What’s your favorite part of the writing/publishing process? Drafting? Editing? Designing the cover (which turned out gorgeous, by the way)? I have things I like about the entire process, but I’d have to say editing is my favorite part. On days where my imagination is really flowing, I LOVE writing, but most of the time editing and perfecting the story is easier and more enjoyable for me. I like knowing I have the whole story down on the computer. Blank pages and giant word goals are far too intimidating sometimes. I also do love designing covers, though I think with future books after Ilyon Chronicles, I will hand those reins over to someone else. Writing and editing are tons of fun…when they are working right! Now for my favorite question: If you could trade places with one of your characters for a day, which character and what day would you pick? 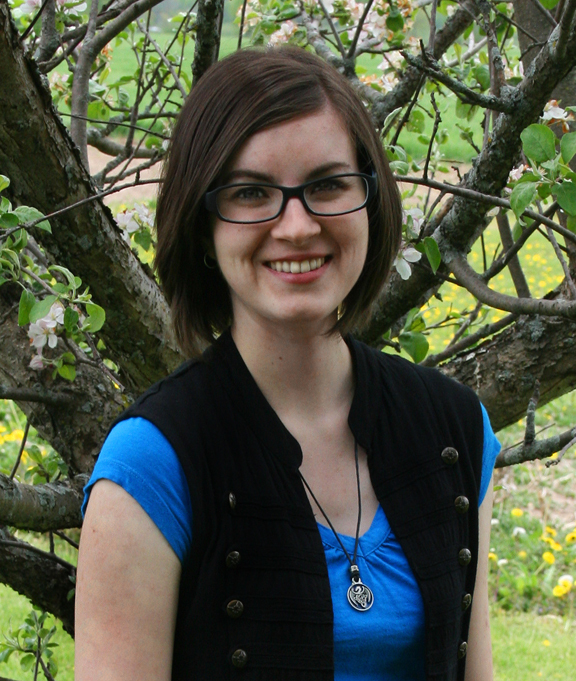 Thanks so much for the interview, Jace, and best wishes on the release of Half Blood! Instead of my Fiction Friday book spotlight, I have another cover reveal for you all. 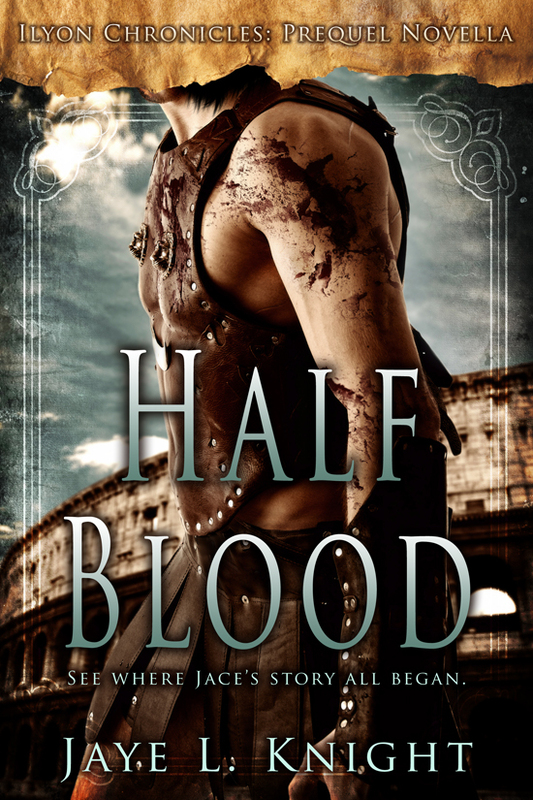 I’m super excited to reveal the cover for Jaye L. Knight’s novella Half Blood. I’m a huge Ilyon Chronicles fan, and I can’t wait until this prequel novella releases! I don’t know about you, but I’m bouncing with anticipation for this book! Jace is my favorite character in the Ilyon Chronicles, and I’ve been dying to learn more about his backstory! 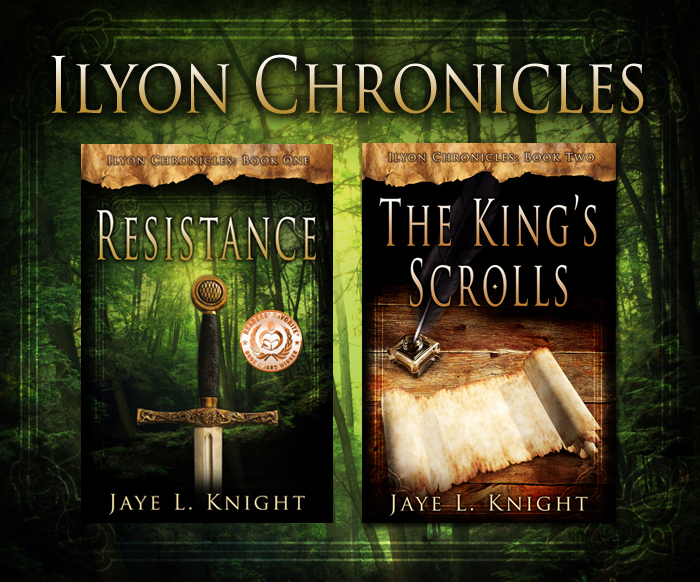 Today I welcome Jaye L. Knight as part of her blog tour for The King’s Scrolls, book two in the Ilyon Chronicles. 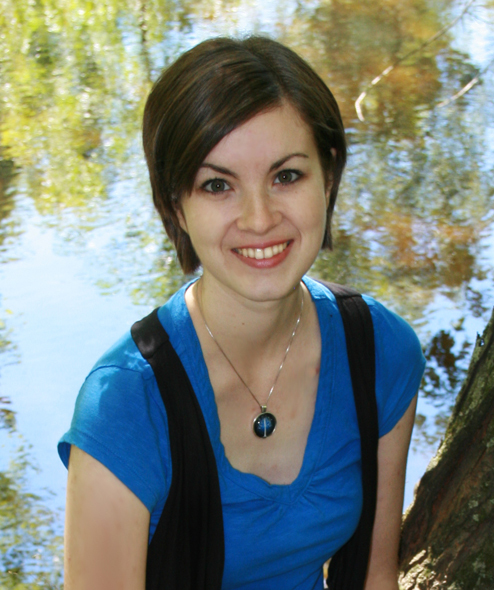 Ever since I read Resistance, Jaye has become one of my favorite Christian Fantasy writers. 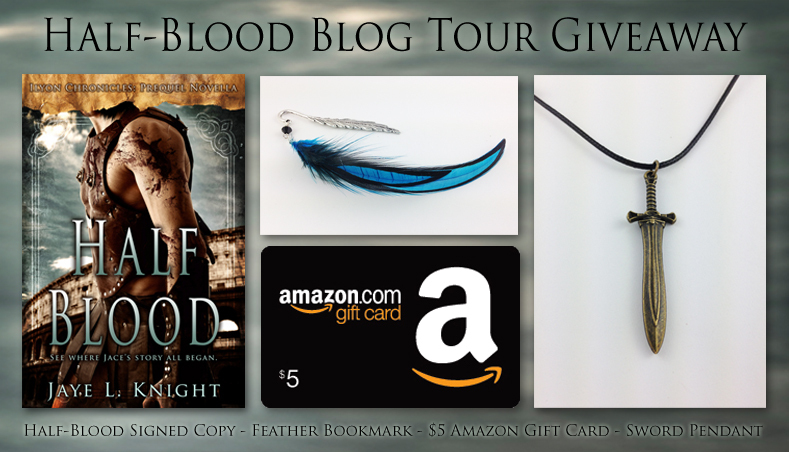 Today is the last day of the blog tour, but you can find the rest of the posts on the tour here. Hi, Jaye! Welcome to The Pen of a Ready Writer. Let’s get things started with a fun question: Chronicles of Narnia or Lord of the Rings? I’m a Lord of the Rings girl, most definitely. I adore the trilogy and The Hobbit (books and movies). I probably wouldn’t be writing fantasy if I had not gotten into LOTR. I’ve read a couple of the Narnia books, but I just never really got into them. *hides from Narnia fans* I do like the movies though . . .
Lord of the Rings girl. The Ilyon Chronicles is a huge series. Six epic fantasy novels! What gave you the idea for such an ambitious project? Well, it sort of forced itself on me and demanded to be written. It started out as only three novels, but quickly outgrew them. The initial idea came while I was reading DragonQuest by Donita K. Paul. I had just read a scene where you discover one of the main characters is a half-blood. This wasn’t a new topic for me since I’d written about half-elves before, but they were always accepted by society. DragonQuest got me thinking, what if I wrote about a half-blood who wasn’t accepted by society? And taking that a step further, what if one half of his blood was a race everyone considered monsters and soulless? Talk about conflict. That’s how my character Jace came to be. The rest of the series grew around him. I have to give all the credit to God for that. I really have no idea how it morphed from one character into such an involved series of books. I absolutely adore Jace! I wanted to give him a hug so badly in Resistance. You dealt with a lot of weighty themes in Resistance: treatment of those who are different, persecution, forgiveness. Does The King’s Scrolls continue those themes or develop a few of its own? I’d say those themes continue, though some aren’t as much a focus as they were in Resistance. Persecution is definitely still a major theme, though. Trust is a big part of The King’s Scrolls, specifically trusting God even when things don’t make sense and it seems like everything is going wrong. I’d say that is the central theme of this book—learning to trust that He has a plan even when it is impossible to understand. I love how the theme plays out in the book! One thing that really impressed me about Resistance and The King’s Scrolls is the quality of the writing, editing, and formatting. It is even more impressive because you’re an indie author who did all of that yourself! What made you decide to pursue indie publishing? Well . . . impatience? 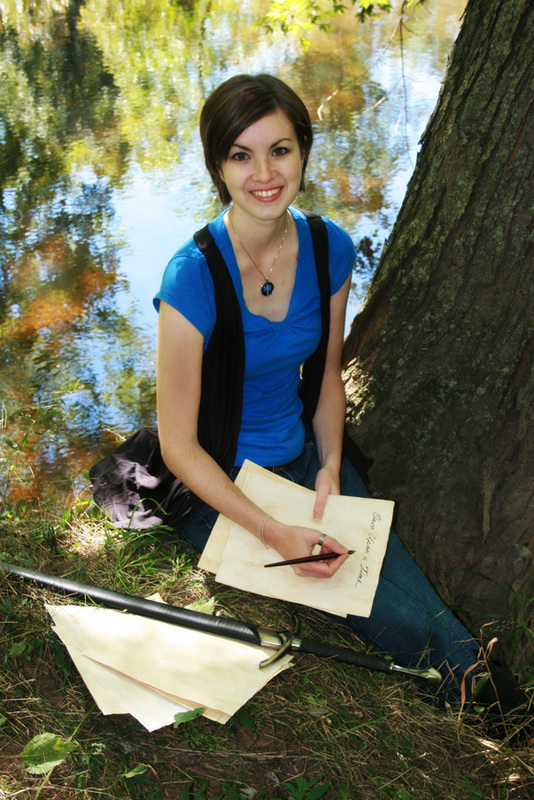 *sheepish look* I was young and impatient to have my book in my hands when I first decided to self-publish. Plus, I had absolutely no idea how I’d get published otherwise, and wasn’t anywhere near ready for such a thing. But now, with the way indie publishing has exploded since then, I’ve come to love it. There are so many more resources available now than there were when 18-year-old me decided to first pursue it. I would have a hard time being convinced to try traditional publishing now. Sounds like something a lot of us young writers can relate to! What is the hardest part of indie publishing? Having to do absolutely everything. It’s a TON of work. Many times, I don’t even have enough time to write. It’s kind of hard to be an author if you’re not actually writing. 😛 It would be nice to have others doing certain work like formatting. Now, I could hire someone to do that, but I prefer to save the money and do it myself. The sheer amount of work can be overwhelming sometimes, but, in the end, it’s worth it. READ THIS BOOK! Seriously! Read it! The King’s Scrolls pick up where Resistance left off, but it also introduces several new characters. I adored Timothy and the other crete characters. The Altair family dynamics play a much bigger role in this book, and we finally get to meet all of Kyrin and Kaden’s brothers. Liam is so sweet and Marcus…well, there’s nothing like the conflict of duty and family to tear a person apart. All the characters are well-crafted, which makes the events in the book more poignant. I’ll admit it. I cried. There is one part of the book…but I can’t give that away. My advice is keep a box of Kleenex handy. New characters, new tests, new adventures, and dragons! A book doesn’t get better than this! To top off all the excitement, Jaye is giving away this awesome prize! This is your last day to enter!